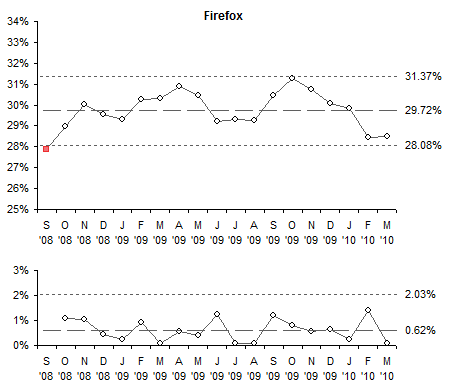 In Web Browser Stats: Problems With Data Gaps I looked at my website statistics to evaluate how relative usage of Internet Explorer, Firefox, and Google Chrome has evolved over the past year and a half. For part of my analysis, I plotted SPC-type control charts of browser stats using a simple mean ± 3 SD approach to control limits. My colleague DaleW reminded me that my quick and dirty approach was not as good as a rigorous Shewhart Individuals control chart analysis. I should have known better; I even covered the individuals chart approach in Introducing Control Charts (Run Charts). To review the approach, the raw data is plotted in two ways. 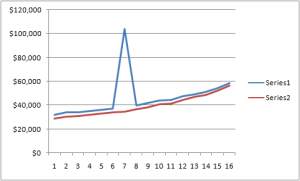 The actual points are plotted in one chart, and the moving ranges (differences between points i and i-1) are plotted in another chart. A horizontal line is drawn on each chart at the mean of the data. Control limits are calculated using the moving range as a measure of variability instead of standard deviation. The upper control limit (UCL) of the moving range chart is calculated as 3.27 times the mean of the moving range, and this is plotted on the moving range chart. The upper and lower control limits (UCL and LCL) of the individual values is given my the mean of the individual values ± 2.66 times the mean of the moving range, and these are plotted on the individuals chart. If there is a trend in the data, the moving range will be smaller than the standard deviation, because the basis for determining variability is difference from the previous point, rather than from the mean of all points. This table shows the individual values and moving ranges for the three main browsers. The means and control limits are computed below the table of values, and values in the table are colored red if they lie outside the control limits. 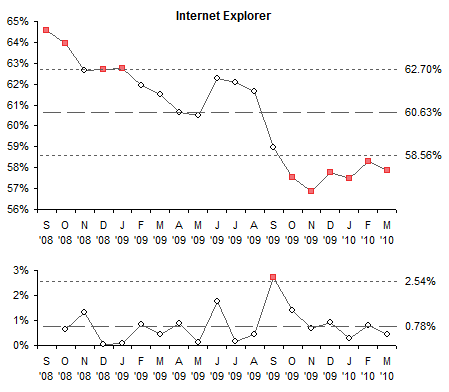 The values show browser usage each month by percent of visits to my site. 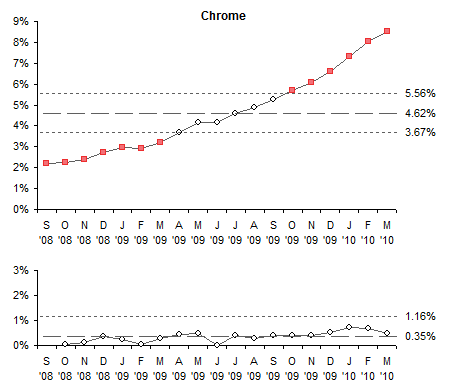 There is a lot of red (i.e., out of statistical control) in the IE and Chrome individual values, notably at the beginning and end, indicating a trend from start to finish. Firefox shows only one red point, and there’s no obvious trend. 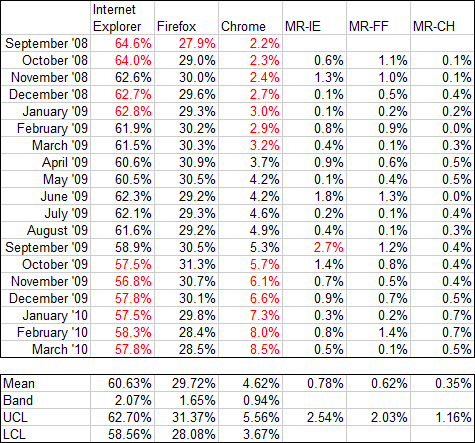 The only red value in the moving range data is a single point for IE. The data is plotted in the following I-MR charts. 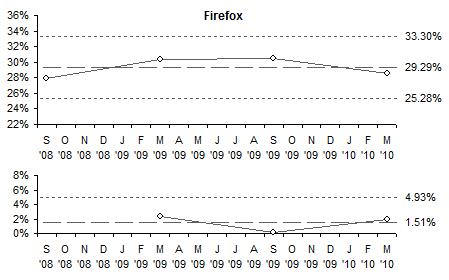 The Y axis ranges are the same for all browsers for easy comparison. 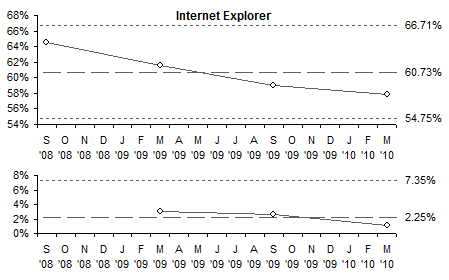 The trends for Internet Explorer and Chrome are rather obvious when the new control limits are plotted. 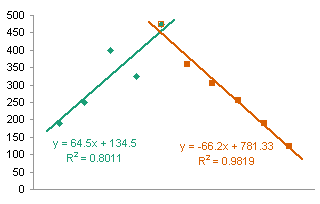 For IE (above) the upper and lower control limits calculated using mean and standard deviation were 67.9% and 53.5%, much further apart than those in the I-MR chart; in fact, those limits fall outside the Y axis scale of the I-MR chart. 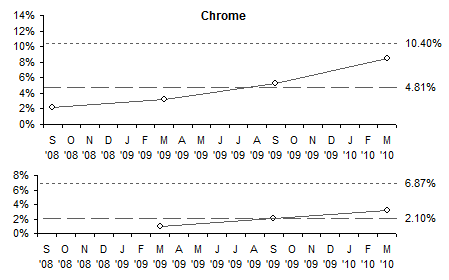 For Chrome (below), the Mean-SD upper control limit is 10.4%, which also falls outside the corresponding I-MR chart. Both calculations for Chrome’s LCL are below zero; since this makes no physical sense, zero is used. 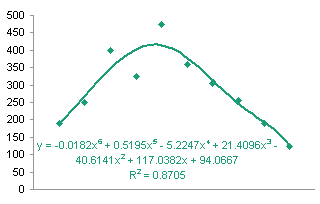 The Firefox control limits based on mean and SD are further apart than the I-MR limits, by one percentage point (32.4% and 27.0%), but would still be visible in this chart. The conclusion from my earlier post was that three points over 18 months is insufficient data to judge whether there was a trend in the browser usage percentages. This conclusion holds when the more rigorous I-MR evaluation is carried out. If we perform the above analysis on four points, one point every six months, the I-MR calculations and charts show the processes are in control, and cannot be attributed to changing patterns of usage. 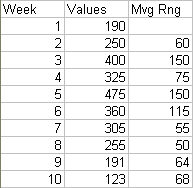 The moving range values are much larger than for monthly data points, since six months of changes are lumped into one point. As a result, the control limits are pushed far enough away from the means that there are no out-of-control points. The data is plotted in the following I-MR charts. 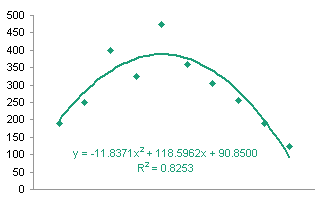 The Y axis ranges are the same for all browsers for easy comparison. Although we “see” trends for Internet Explorer and Chrome, since there are no points outside the control limits and not enough points to invoke the special Western Electric rules, we cannot conclude there is any variation not attributable to random fluctuations. Posted: Wednesday, April 7th, 2010 under SPC. Tags: Run Charts, site statistics, Statistical Process Control. Last year I wrote an Introduction to Control Charts (Run Charts). I referenced a favorite book of mine, Understanding Variation: The Key to Managing Chaos, by Donald Wheeler of SPC Press, an expert in Statistical Process Control. This book is a quick read, and it’s a great introduction to control charts, written clearly using layman’s terms, with a number of very good examples to illustrate their use. In fact, in my last engineering job before becoming a full-time Excel jockey, I was frustrated by many operational features in the manufacturing facility where I worked. As I reread Wheeler’s book, I could relate many observed behaviors in the plant with examples in the book. Most examples, of course, showed misuse of reporting as well as optimization of separate departments to the detriment of the business as a whole. My employer talked the talk of SPC and Six Sigma, but nobody with any authority understood statistics or processes, so the company walked a random walk through the jargon of process control. A control chart, or run chart, is essentially a time series that shows variation in a process output over a period of time. The time may be defined by an actual date or time, or by a number indicating how many times the process has been carried out. Control charts were developed in the 1920s by Walter Shewhart while he was working at Bell Labs. Shewhart was investigating ways to improve product reliability by reducing and controlling manufacturing variability, and the control chart was Shewhart’s means of distinguishing random variability inherent in a process from “special causes” extrinsic to the process. Wheeler’s book demonstrates statistical process control using the simplest type of control chart. This is called an Individuals chart, so named because it is based on individual measured values. The moving range (difference between sequential measurements) is used to calculate control limits for the chart. Individuals charts are also called XMR (or XmR) charts, to denote the individual X values and the moving ranges. The Individuals chart is used when individual values or rates are collected periodically. Examples of this type of data may be daily scrap rates in a production line, or a company’s monthly sales. Depending on the type of data being tracked, and on how it’s collected, there are actually several different types of control charts. Other types of control charts are better suited to data which is collected in groups. 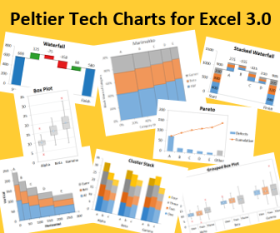 While the Individuals chart plots the individual measured values and uses the moving range to provide statistical context, XbarR and XbarS charts are used when a batch of measurements comprise each sample. The average measurement from the group (Xbar) is plotted, while either the range (XbarR, for small batches) or sample standard deviation (XbarS, for larger sample sizes) of each sample is used for the calculation of control limits. I have seen one reference to the use of medians rather than means in these charts, but these variants must be rare. 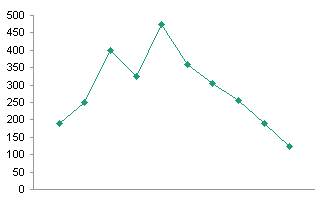 If counts are measured (for example, the number of defective parts in a batch), several other control chart types have been developed to display the run chart behavior. These are known as P, C, nP, and u charts. 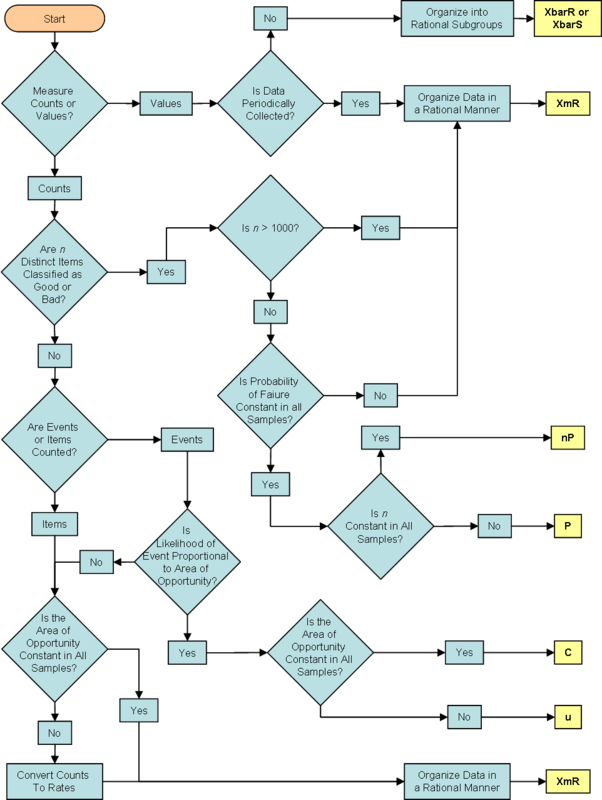 To help sort out the different types of control charts, Wheeler has laid out the requirements of each in the form of a flow diagram. 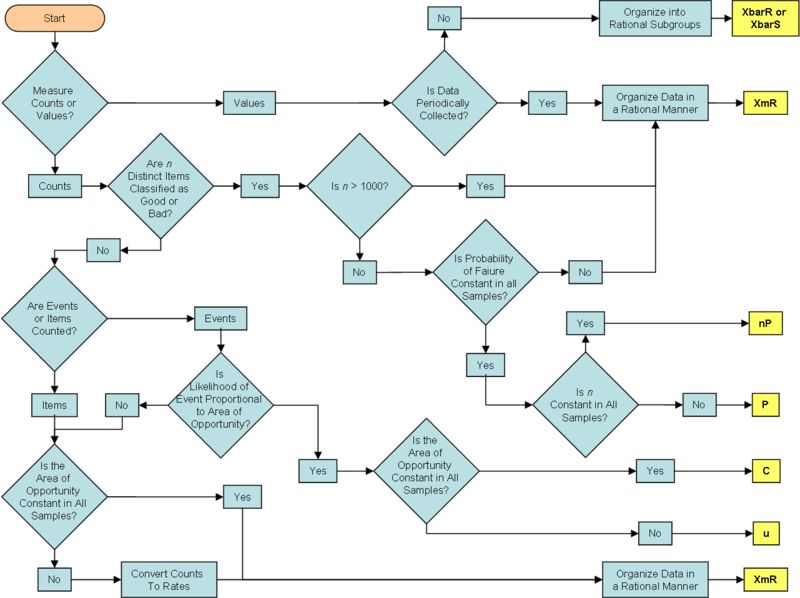 The only version I have of Wheeler’s diagram is a second-hand distorted GIF file, so I’ve redrawn the flow chart in both vertical and horizontal orientations. This is a handy reference if you are building your own control charts, but an SPC software package will automatically select the appropriate control chart based on the data provided. In a series of posts I will show how to create each type of control chart in my favorite statistical process control software platform, and I will present real-world examples of each. I will also cover interpretation of control charts. A process is in control when its variability is described by the natural statistical variation defined by measurements taken over a period of time. When the process goes “out of control” (or “out of statistical control”), it indicates a possible change to the process, because the statistical rules determining the variability in the process have changed. The natural process limits in a control chart are constructed to contain variations within 3 standard deviations above and below the mean, or 99.7% of naturally occurring variations. Any measurement outside this range is out of control, and special causes for this variation should be identified. Obviously, a process is out of control when a measurement falls outside of the upper or lower control limits drawn on the control chart. The probability that this may occur naturally is 0.3%, sufficiently rare to warrant examination of the process when this occurs. Other patterns in the data also merit special investigation. For example, too many consecutive measurements above or below the mean may indicate loss of statistical control of a process. Too many consecutive measurements that trend in one direction, or too many consecutive alternating measurements, may signal a process shift. 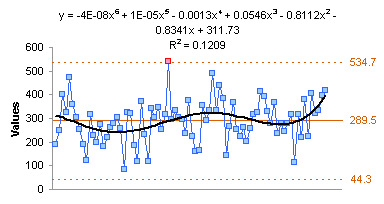 A change in the process may be indicated by having too much, or not enough, variation within the ± 3 sigma limits. Not enough variation sounds like a good thing, doesn’t it? Well, it probably is. Not all process change is necessarily bad. But if this change is not understood, then it cannot be reproduced, measured, and controlled. Thus, even if the change results in less variability, it is not a good change. A number of rules have been established that define patterns that may indicate change in the underlying process. I will cover these special rules in a post in this series on the control chart. Software packages that produce run charts have these rules built in, but it is good to understand their basis. Posted: Thursday, February 5th, 2009 under SPC. Tags: control chart, Run Chart, Statistical Process Control. A simple chart can be very useful to check for patterns or errors in your data. Such features of the data may be difficult or impossible to find in the tabulated data, but they jump out from a simple chart. Jorge Camoes suggests in Validate Your Tables – US Census Bureau Example that we make a quick chart to make sure the data “looks” correct. Jorge was looking at some data from the US Census Bureau, and it didn’t seem correct. So he made a simple plot. Posted: Monday, August 4th, 2008 under SPC.